RECOGNIZE “FIRST AID” FOR HELP! 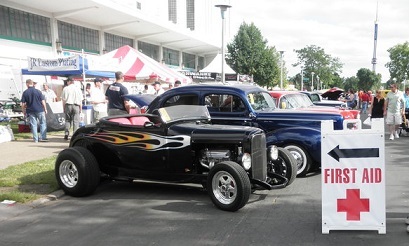 MSRA is so proud of the volunteer Minnesota Street Rod Association First Aid Team! These dedicated men and women are led by April Warner and Mike Dahlberg! At the MSRA membership events, and during Back to the 50’s Weekend, our highly qualified volunteer First Aid staff members are available to help in case of an emergency medical situation! MSRA First Aid team members at BTT50’s. If you need first aid help please contact ANY MSRA staff member with a radio. In case of an emergency please still dial 911 and then try to contact MSRA staff members with a radio. We will then be able to dispatch First Aid Team members to the emergency for immediate medical attention. When you call for medical help please remain stationary so the First Aid Team can easily locate where you are at! IMPORTANT: Just a friendly reminder the First Aid Team does not have or carry any over the counter medications. NEW THIS YEAR – CHILD/VULNERABLE ADULT BRACELETS! Using the same protocol the MN State Fair uses, this year you will be able to pick up a bracelet for your child/vulnerable adult. The bracelet is red and will be available at two locations: the First Aid Station on Cosgrove just south of Randall, and at the Information Booth on the corner of Underwood and Dan Patch. What would you do if you lost your child at Back to the 50’s or another large venue like the Minnesota State Fair? One minute you are looking at a beautiful 1963 Pontiac Bonneville Ambulance that was used in the movie “A Dog’s Purpose”, and you turn around, and your child/vulnerable adult is gone.You frantically look around for your child/vulnerable adult but they are nowhere to be found. What do you do? Would you be able to identify what clothes your child/vulnerable adult was wearing when you are in a panic? This is the opening paragraph of a short by very important article written by Jennifer Lacey, EMT, and offers valuable tips. We encourage parent, grandparents, guardians, and caregivers to take one minute of your time to read it. CLICK HERE for a pdf of the article. First Aid team members/crews can be located at the first aid station, walking out-and- about, and on golf carts throughout the fairgrounds from Thursday through Sunday. Our station is located on the North West side of the fairgrounds on the corner of Cosgrove and Randall Ave.
Each volunteer team member can be recognized by the distinctive and highly visible safety green T-shirt with “First Aid” printed in red, on the front and back of the shirt, while they are on duty. 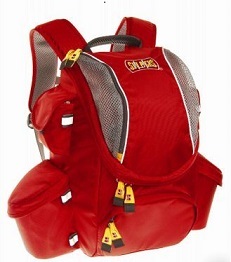 Members will also be carrying a large red medical backpack when they are walking out-and-about. Team members that are assigned to carts will be wearing the safety green t-shirts as well. The carts will be marked “First Aid” and will display a medical flag to be easily identified . Please be advised that our First Aid staff on carts will be allowed to travel on one way streets, and against traffic if needed, to assist. So please “Make Way” and let us through! When called to an emergency situation we will take the shortest route available to get help there quickly! From the 60+ First Aid team of volunteers ….